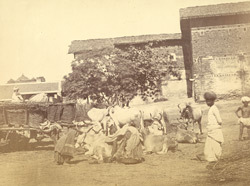 Photograph of women gathering cowdung at Ahmadabad in Gujarat, taken by Shivashanker Narayen in c. 1870, from the Archaeological Survey of India. Narayen contributed to the book 'The People of India', published by the India Museum in 1868-75. After photography was introduced into India in the 1840s it rapidly grew in popularity, particularly as a means to record the vast diversity of people and their dress, manners, trades, customs and religions. Cow dung is collected and made into flat round 'patties' which are dried on walls and roofs and then sold as fuel and used extensively on cooking fires and for heating. It has many other uses, including fertiliser and as a flooring material when mixed with mud and water.